The Lingqijing is also called 'The Magical Chess Pieces Classic'. 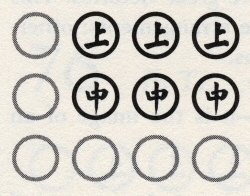 Chinese chess pieces are flat disks like draughts pieces. 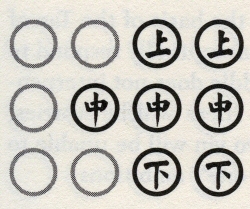 The Lingqijing has no relation to actual Chinese chess (Xiangqi), it is just that the 'magical tokens' used to consult it resemble Chinese chess pieces. The first commented edition of the work appeared in the Jin Dynasty (265-420). Verse 87 is identical to verse 351 in the Shen Shu (and maybe more verses). Since the latter is older, it seems the Lingqijing borrowed from the Shenshu. The Lingqijing is a Chinese book of divination. 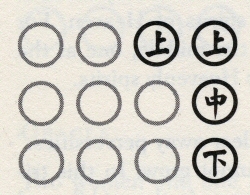 The first commented edition of the work appeared in the Jin Dynasty. Legend has it that the strategist Zhang Liang got it from Huang Shigong, a semi-mythological figure in Chinese history. It seems there are several slightly different texts. It is often used by street diviners. 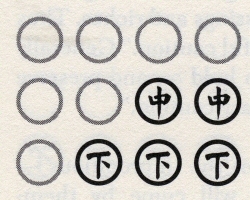 There are only two translations in English, 'Ling Ch'i Ching' by Ralph D Sawyer and Mei-chün Lee Sawyer, and 'Spirit Tokens of the Ling Qi Jing' by Ivan Kashiwa. 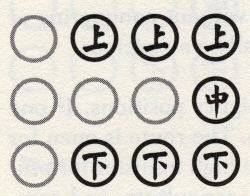 Twelve chess pieces are used; each is a disc with a character on one side, and unmarked on the other. 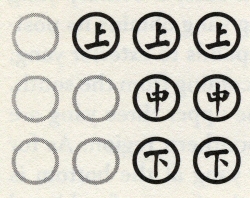 Four have the character for "up" (上, pronounced shang), four have the character for "middle" (中, zhong), and four have the character for "down" (下, xia), representing the Three Realms: Heaven (天, tian), Humanity (人, ren), and Earth (地, di), respectively. 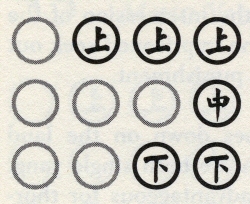 The pieces are cast and the resulting combination is looked up in the text of the Lingqijing for what fortune the combination means. 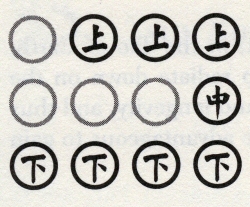 The text of the Lingqijing has an entry for all 125 combinations (i.e., three kinds of pieces, times the five possibilities for each kind: one through four pieces landing face up, or none). T’ai-i commands the soldiers, Jade Woman by his side. Wu Hsien precedes them shaking a spirit-duster to clear away perversities. (T’ai-i is the most honored spirit in heaven, jade Woman and Wu Hsien act as his assistants. Above and below both settled, the mind does not give birth to perversity. Contented, it has no worries. Do not believe rumors. Seeking out the families Wang and Hsieh. Climbing high, peering out far, above I see the Milky Way. The divine, exalted Jade Woman bestows a spiritual talisman on me. And thus preserves my body. I must still await a buyer to sell them. I will not trouble myself with planning ordinary affairs. The perfected man seeks her. She confers blessing on me. Do not lose her counsel. Bright virtue exceedingly glorious, longevity unbounded. The seven stars of the Dipper protect me. There will be a transfer to a generously renumerated position. Great good fortune for generations. The boat floats easily down the river. The outer courtyard is again renewed. To pray for the intercession of the spirits and seek good fortune. Will stem from the power of Heavenly and Earthly spirits. When anxiety comes, guard against it in the darkness. Will you manage to dispel calamity and disaster. A cluster of yin looks to overcome yang. Old and young gain peace and repose. The land peaceful and tranquil, without hardship or difficulty. and is advantageous to go forth and return. An enlightened ruler above, no perversity or evil below. demotions and promotions have been brilliantly affected. Claws and teeth now complete, beyond hardship and suffering. Shortly to become a man of Heaven in the human realm. Ruler and minister all excelled. The prime ministers approved the plans. The vile and malevolent were forever forced aside. The image of respectful caution. Be respectfully cautious and appropriately reverent. Blessings and riches will come by themselves. Riding the wind, spreading its wings, it reaches the toad’s palace. Sooner or later your fame will extend throughout the nine directions.